For Chinese people who zealously pursue a degree from overseas, North Korea is not exactly the most popular choice. But some curious students have crossed the border to experience North Korean education. Sarah (pseudonym), 22, is one such student that the Global Times contacted. A student at the Guangdong University of Foreign Studies, Sarah secured an opportunity to spend two semesters in Kim II-sung University in 2015 by joining a Chinese government-backed exchange program. "I've imagined so much about North Korea and have heard so many rumors about it. So I decided to take a look for myself. After spending time there, I have to say my experience of the country is much better than what I expected," she told the Global Times. "But the curriculum and textbooks weren't very useful." According to a report on chinanews.com, every year the Chinese government offers 60 students full scholarships to North Korean universities. Around 70 students a year also pay for their own tuition. According to the website of the Chinese embassy in North Korea, the 60 students they sent to North Korea in 2014 came from nine universities, most of which were schools focusing on foreign languages. Sarah said her school has several spots on the program every year for students majoring in Korean. As she had a good academic record, she was offered a place in 2015 without putting in much effort. She revealed that in 2013, the students at her school who were offered places didn't end up going to North Korea. "Maybe it's because of political tensions at that time. But I am not sure whether or not it was only my school that got suspended," she said. In February 2013, North Korea launched its third underground nuclear test, arousing tensions in the Korean Peninsula and surrounding nations. When Sarah first arrived in North Korea, she lived with a local woman. The two shared one room. "At first I was a bit nervous, worrying that she was monitoring me. But later I found out that she was nice and treated me well. She often shared her snacks with me," she recalled. But the conversations between them were quite limited. They didn't talk about politics and most of the time, the North Korean woman liked to ask Sarah about her "family issues." "She raised more questions than I did. When I asked her about her family like her father's job, I got different answers every time. Eventually, I got fed up and stopped asking her those questions," she said. However, she said that overall she was "quite satisfied" with the experience and the natural environment there was quite pleasant. "The people there seemed happy. And their lifestyle seemed healthier than Chinese people's. Without the Internet, they like go outdoors and play sports," said Sarah. 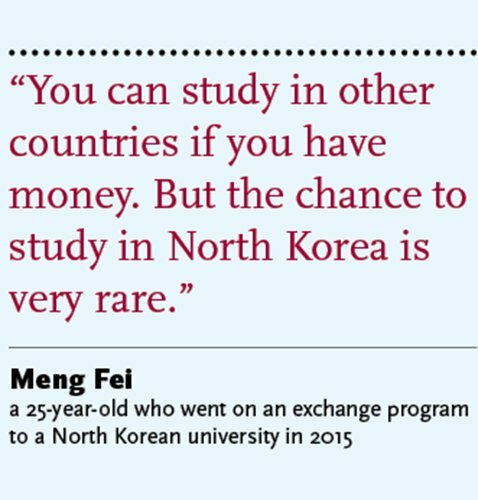 Meng Fei, 25, who studied in North Korea in 2015, told the Global Times that Chinese students are sent either to Kim II-sung University or to the Kim Hyung-jik University of Education, which are both in the capital Pyongyang. Kim II-sung University was founded in 1946 and is the best university in the country. Zhang Dejiang, chairman of the Standing Committee of the National People's Congress, graduated from this university in 1980. Kim Hyung-jik University of Education is the country's best teaching university. "I wanted to experience a totally different environment. You can study in other countries if you have money. But the chance to study in North Korea is very rare," said Meng, who just graduated from Beijing International Studies University majored in Korean. Besides the free education, State-funded students like Sarah and Meng are given $250 every month and North Korea gives them $40 per month as a cost of living subsidy. Room and board are free. The students only need to attend classes in the morning. In the afternoons, Sarah said students in their program often arranged free tours to museums, monuments or mountains. At the beginning, they were required to write "review articles" about each tourist attraction they went to, but after complaining they were allowed to enjoy sightseeing without extra work. According to Sarah, they didn't need to learn about Juche, the official North Korean ideology. They studied Korean reading, translation, conversation and so on. "The name of their leaders were in bold in the textbooks and most of the content of their textbooks are related to the leaders, praising their greatness," she said. She added that if they ever wrote the leaders' names incorrectly, they had to either erase it with correction fluid or fully obliterate the word with their pen, rather than just crossing it out. While in class, some teachers asked them about the outside world. In 2015, when it was reported that South Korea had fired artillery shells at North Korea, her teachers asked them in class "how is the situation being reported in the Chinese media?" But after class, the teachers and students had no contact. Personally, Sarah believes that if she wrote or said positive things about the Korean leaders it would bring good academic scores. She recalled that in a speech contest for Chinese students, a student who said nice things about the Kim family won the top prize. "But we're free to talk and write in the way we like," she added. Geng Yu (pseudonym) went to North Korea for his undergraduate studies in 2014. He was a self-funded student, and the tuition fees for one term were about $7,000. "My family does some business with North Korea. Also, I'm an ethnic Korean but I can't speak Korean. So my parents sent me there," he said. According to Geng, most self-funded students end up there because their families have business connections in North Korea. Geng spent his first year in the Kim Hyung-jik University of Education to study Korean and then was transferred to Kim II-sung University. When the Global Times contacted several leading study abroad agencies about studying in Pyongyang, they all said they didn't provide such services. Geng said all the self-funded students apply on their own. In Geng's class, there were students from Laos, Vietnam and even Canada. "These students study here because they have family members working in the embassies in North Korea," he said. Besides the high tuition fees, Meng said getting Internet in the country is very costly. Getting 3G mobile Internet cost him more than $200 at first and over $100 a month thereafter. As he was tasked with managing his fellow Chinese students, Meng had to work with the North Korean university officials. "I avoided talking about sensitive political topics," he said. Most of the time, he only communicated with them about simple day-to-day problems. When the Chinese students arrived for the start of the semester, their dormitories often suffered power cuts without advance notice. Sometimes, the electricity was out for only three minutes and sometimes for hours. In the dry autumn, it happened regularly. After chatting with the other side, they got warning in advance, though the cuts continued. According to Sarah and Meng, as foreign students, they enjoyed more freedom to wander around the country than tourists. 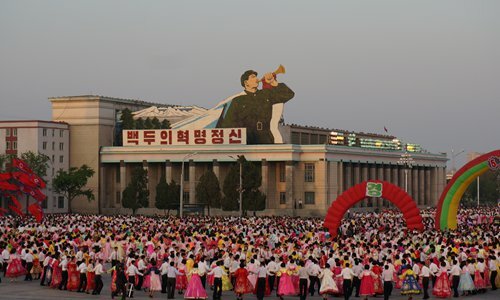 They could travel from city to city without a tour guide and were also permitted to take the subway in Pyongyang, which is prohibited for others aside from a few fancy "show" stops. But sometimes, when they were on the subway, they were asked to identify themselves by North Koreans. "We had to tell them our names and the university where we study. Sometimes, my friend pulled out textbooks to prove our identity," said Sarah. Experiencing so many novelties, Sarah said her seven-month stay in North Korea was one of the most carefree times in her life. "Without the Internet, people can get closer. We talked and played together, which is hard to expect in today's China when everyone is addicted to cell phones," she said. Her memories also included one time when they visited a beach with North Korean students and they all danced together. "At that time, I felt I was finally becoming one with them without any barriers," she said. Meng said Chinese students in North Korea are able to get unusual opportunities because there aren't that many of them in North Korea. He managed to meet and take photos with Liu Yunshan, a senior Communist Party of China leader, when he visited North Korea and Sarah was even once invited to watch a military parade. Meng's experiences there have brought him another opportunity. A Chinese company hired him to work in North Korea and he will soon step on its soil once again.